Give your plants the attention they need this summer! Ensure they remain sufficiently watered with these tips. The summer months can bring intense levels of heat that can have damaging effects on your property’s plant life. Since this is the case, watering your plants should never be an afterthought. Your plants will not thrive unless provided with sufficient amounts of water. 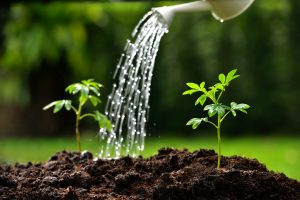 If you want your landscape to look its best for the remainder of summer, here are some helpful tips for watering your plants. Not only does mulch look nice and accentuates the appearance of your plants, but is commonly used in landscaping for another reason. Experienced gardeners know that mulch will reduce the amount of surface runoff. It does a phenomenal job at holding in soil moisture, which will help prevent your plants from drying out during hot weather. By incorporating mulch around a plant, the roots will remain cooler when faced with warmer temperatures. In most cases, the best time to water your plants is in the morning. The amounts of water they need will vary dependent on the type of plant and the outside temperature. However, since a plant’s buds are open during the day, it is a good idea to water them in the mornings for optimal growth. By doing so, the water will be able to reach the plant’s roots and be accessible to the plant when it needs it. If you wait to the middle of the day to water your plants, a large percentage of the water will evaporate. The more you know about your plants, the better off you will be. Along with doing your research of each of your plant types, it is in your best interest to carefully observe your plants throughout the hot summer months. Monitor how your plants react to different temperatures and quantities of water. If you continuously take note of the color and feel of your plants, you will be able to spot the early signs of dehydration. For example, some plants will droop, and others will change colors when they are without water for extended periods. If you educate yourself on each of the various plant species on your property, you will know how, and when to take action in your garden. This entry was posted on Saturday, July 1st, 2017 at 1:01 pm. Both comments and pings are currently closed.